Göbekli Tepe (Turkish for "Potbelly hill") is a hilltop sanctuary erected on the highest point of an elongated mountain ridge some 15 km northeast of the town of Şanlıurfa (formerly Urfa / Edessa) in southeastern Turkey. The site, currently undergoing excavation by German and Turkish archaeologists, was erected by hunter-gatherers in the 10th millennium BC (c. 11,500 years ago), before the advent of sedentism. 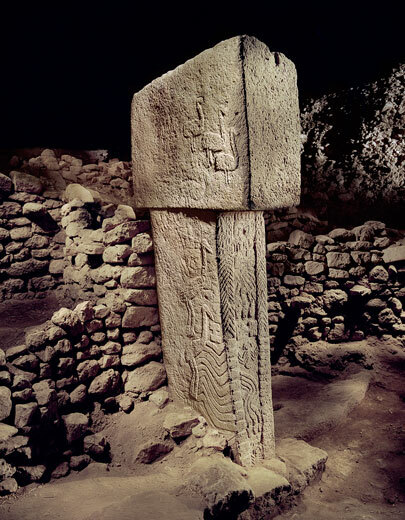 Together with Nevalı Çori, it has revolutionized understanding of the Eurasian Neolithic. 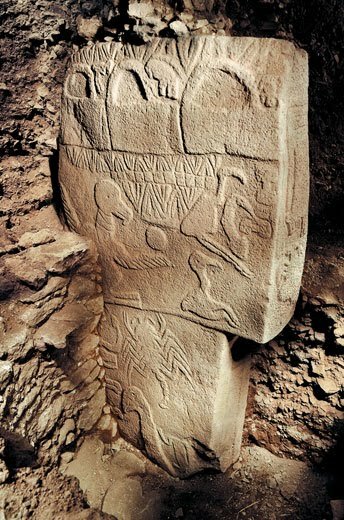 Göbekli Tepe is located in southeastern Turkey. 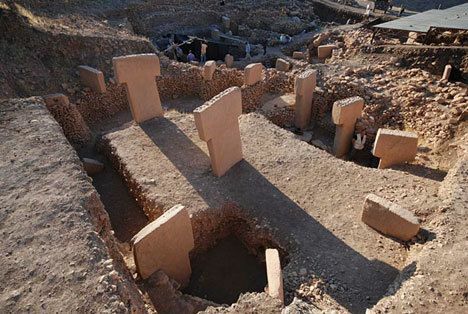 It had already been noted in an American surveyGerman Archaeological Institute (Istanbul branch) and Şanlıurfa Museum, under the direction of the German archaeologist Klaus Schmidt (1995–2000: University of Heidelberg; since 2001: German Archaeological Institute). Schmidt says that the stone fragments on the surface made him aware immediately that the site was prehistoric. Before then, the hill had been under agricultural cultivation; generations of local inhabitants had frequently moved rocks and placed them in clearance piles; much archaeological evidence may have been destroyed in the process. Scholars from the Hochschule Karlsruhe began documenting the architectural remains. They soon discovered T-shaped pillars, some of which had apparently undergone attempts at smashing. Stratum II, dated to Pre-Pottery Neolithic B (PPNB) (7500–6000 BC), has revealed several adjacent rectangular rooms with floors of polished lime, reminiscent of Roman terrazzo floors. The most recent layer consists of sediment deposited as the result of agricultural activity. 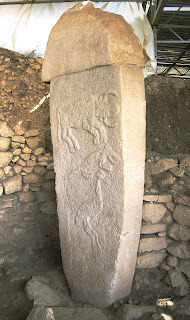 The monoliths are decorated with carved reliefs of animals and of abstract pictograms. The pictograms may represent commonly understood sacred symbols, as known from Neolithic cave paintings elsewhere. The carefully carved figurative reliefs depict lions, bulls, boars, foxes, gazelles, asses, snakes and other reptiles, insects, arachnids, and birds, particularly vultures and water fowl. At the time the shrine was constructed the surrounding country was much lusher and capable of sustaining this variety of wildlife, before millennia of settlement and cultivation resulted in the near–Dust Bowl conditions prevailing today. 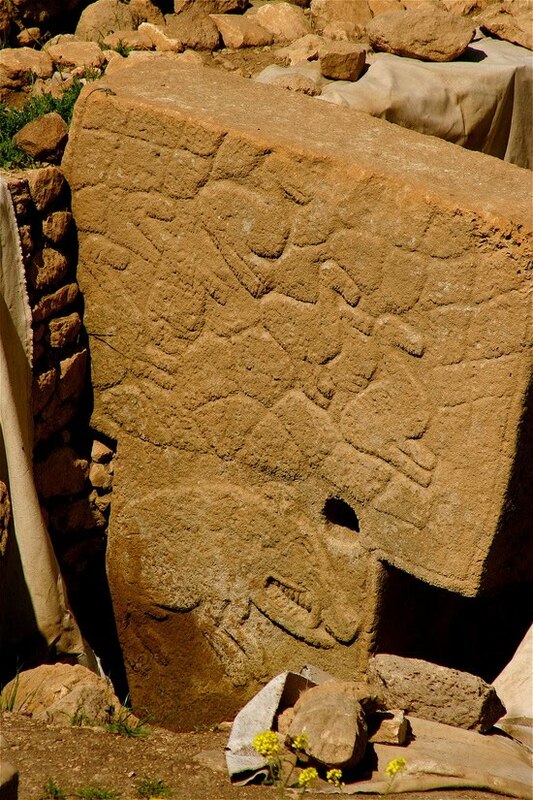 Few humanoid forms have surfaced at Göbekli Tepe, but include a relief of a naked woman, posed frontally in a crouched position, that Schmidt likens to the Venus accueillante figures found in Neolithic north Africa; and of at least one decapitated corpse surrounded by vultures. Some of the pillars, namely the T-shaped ones, have carved arms, which may indicate that they represent stylized humans (or anthropomorphic gods). 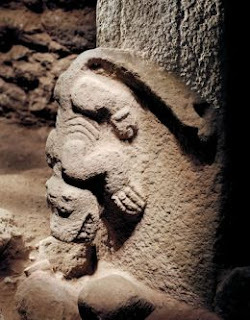 Another example is decorated with human hands in what could be interpreted as a prayer gesture, with a simple stole or surplice engraved above; this may be intended to represent a temple priest. 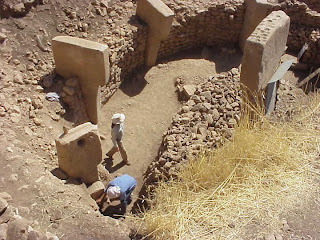 While the structures are primarily temples, more recently smaller domestic buildings have been uncovered. Despite this, it is clear that the primary use of the site was cultic and not domestic. Schmidt believes this "cathedral on a hill" was a pilgrimage destination attracting worshipers up to a hundred miles distant. Butchered bones found in large numbers from local game such as deer, gazelle, pigs, and geese have been identified as refuse derived from hunting and food prepared for the congregants. While the site formally belongs to the earliest Neolithic (PPN A), up to now no traces of domesticated plants or animals have been found. The inhabitants were hunters and gatherers Schmidt speculates that the site played a key function in the transition to agriculture; he assumes that the necessary social organization needed for the creation of these structures went hand-in-hand with the organized exploitation of wild crops. For sustenance, wild cereals may have been used more intensively than before; perhaps they were even deliberately cultivated. Recent DNA analysis of modern domesticated wheat compared with wild wheat has shown that its DNA is closest in structure to wild wheat found on Mount Karaca Dağ 20 miles away from the site, leading one to believe that this is where modern wheat was first domesticated. who nevertheless lived in villages for at least part of the year. Schmidt considers Göbekli Tepe a central location for a cult of the dead. He suggests that the carved animals are there to protect the dead. 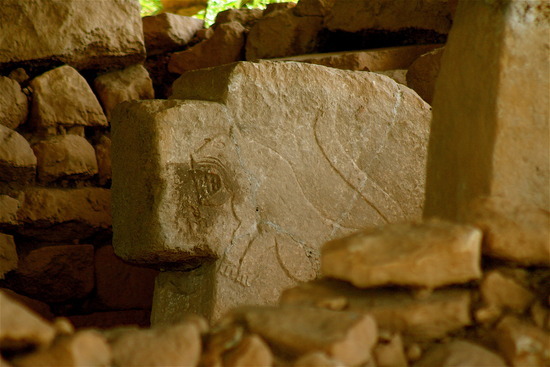 Though no tombs or graves have been found so far, Schmidt believes they remain to be discovered beneath the sacred circles' floors. Schmidt also interprets it in connection with the initial stages of an incipient Neolithic. It is one of several neolithic sites in the vicinity of Mount Karaca Dağ, an area where geneticists suspect the origins of at least some of our cultivated grains (see Einkorn). Such scholars suggest that the Neolithic revolution, i.e., the beginnings of grain cultivation, took place here. Schmidt and others believe that mobile groups in the area were forced to cooperate with each other to protect early concentrations of wild cereals from wild animals (herds of gazelles and wild donkeys). 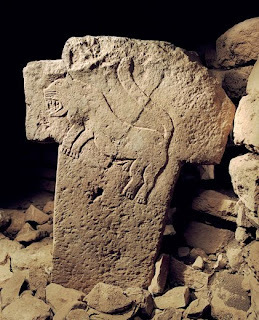 This would have led to an early social organization of various groups in the area of Göbekli Tepe. Thus, according to Schmidt, the Neolithic did not begin on a small scale in the form of individual instances of garden cultivation, but started immediately as a large-scale social organisation ("a full-scale revolution"). All statements about the site must be considered preliminary, as only about 5% of the site's total area has been excavated as yet; floor levels have been reached in only the second complex (complex B), which also contained a terrazzo-like floor. Schmidt believes that the dig could well continue for another fifty years, "and barely scratch the surface." So far excavations have revealed very little evidence for residential use. Through the radiocarbon method, the end of stratum III can be fixed at c. 9000 BC (see above); its beginnings are estimated to 11,000 BC or earlier. Stratum II dates to about 8000 BC. Göbekli Tepe is regarded as an archaeological discovery of the greatest importance since it profoundly changes our understanding of a crucial stage in the development of human societies. It seems that the erection of monumental complexes was within the capacities of hunter-gatherers and not only of sedentary farming communities as had been previously assumed. In other words, as excavator Klaus Schmidt puts it: "First came the temple, then the city." This revolutionary hypothesis will have to be supported or modified by future research. 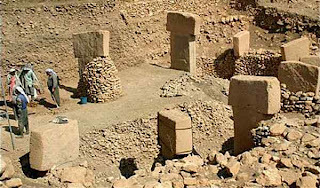 Not only its large dimensions, but the side-by-side existence of multiple pillar shrines makes the location unique. There are no comparable monumental complexes from its time. 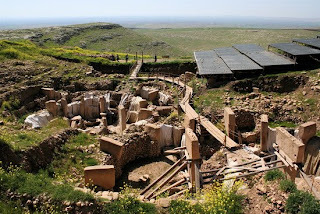 Nevalı Çori, a well-known Neolithic settlement also excavated by the German Archaeological Institute, and submerged by the Atatürk Dam since 1992, is 500 years later, its T-shaped pillars are considerably smaller, and its shrine was located inside a village; the roughly contemporary architecture at Jericho is devoid of artistic merit or large-scale sculpture; and Çatalhöyük, perhaps the most famous of all Anatolian Neolithic villages, is 2,000 years younger. At present, Göbekli Tepe raises more questions for archaeology and prehistory than it answers. We do not know how a force large enough to construct, augment, and maintain such a substantial complex was mobilized and paid or fed in the conditions of pre-Neolithic society. 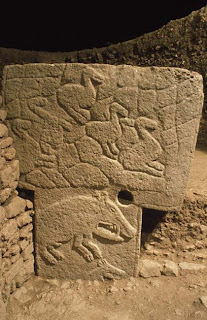 We cannot "read" the pictograms, and do not know for certain what meaning the animal reliefs had for visitors to the site; the variety of fauna depicted, from lions and boars to birds and insects, makes any single explanation problematic. 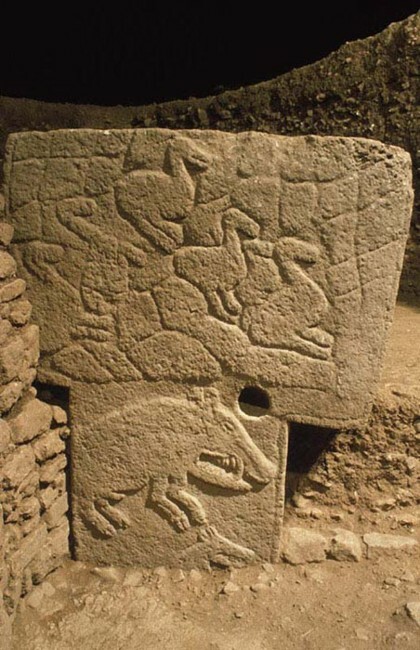 As there seems to be little or no evidence of habitation, and the animals depicted on the stones are mainly predators, the stones may have been intended to stave off evils through some form of magic representation; it is also possible that they served as totems. It is not known why more and more walls were added to the interiors while the sanctuary was in use, with the result that some of the engraved pillars were obscured from view. Burial may or may not have occurred at the site. 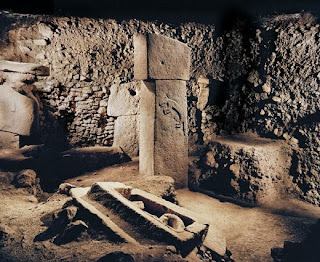 The reason the complex was eventually buried remains unexplained. Until more evidence is gathered, it is difficult to deduce anything certain about the originating culture. As a child, Klaus Schmidt used to grub around in caves in his native Germany in the hope of finding prehistoric paintings. Thirty years later, representing the German Archaeological Institute, he found something infinitely more important -- a temple complex almost twice as old as anything comparable on the planet. "This place is a supernova", says Schmidt, standing under a lone tree on a windswept hilltop 35 miles north of Turkey's border with Syria. "Within a minute of first seeing it I knew I had two choices: go away and tell nobody, or spend the rest of my life working here." Behind him are the first folds of the Anatolian plateau. Ahead, the Mesopotamian plain, like a dust-colored sea, stretches south hundreds of miles to Baghdad and beyond. 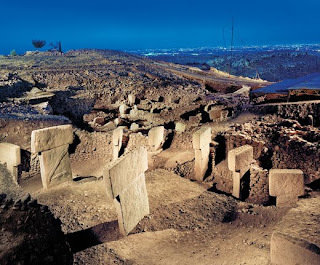 The stone circles of Gobekli Tepe are just in front, hidden under the brow of the hill. 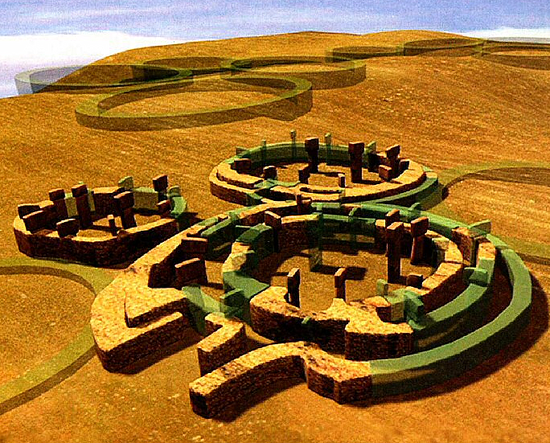 Compared to Stonehenge, Britain's most famous prehistoric site, they are humble affairs. 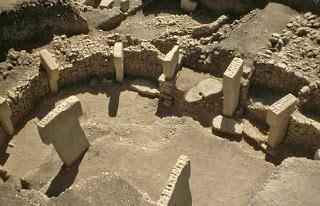 None of the circles excavated (four out of an estimated 20) are more than 30 meters across. What makes the discovery remarkable are the carvings of boars, foxes, lions, birds, snakes and scorpions, and their age. Dated at around 9,500 BC, these stones are 5,500 years older than the first cities of Mesopotamia, and 7,000 years older than Stonehenge. Never mind circular patterns or the stone-etchings, the people who erected this site did not even have pottery or cultivate wheat. They lived in villages. But they were hunters, not farmers. 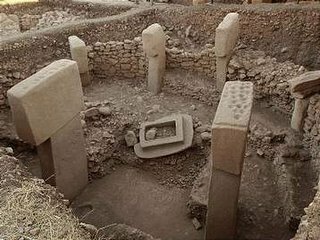 "Everybody used to think only complex, hierarchical civilizations could build such monumental sites, and that they only came about with the invention of agriculture", says Ian Hodder, a Stanford University Professor of Anthropology, who, since 1993, has directed digs at Catalhoyuk, Turkey's most famous Neolithic site. 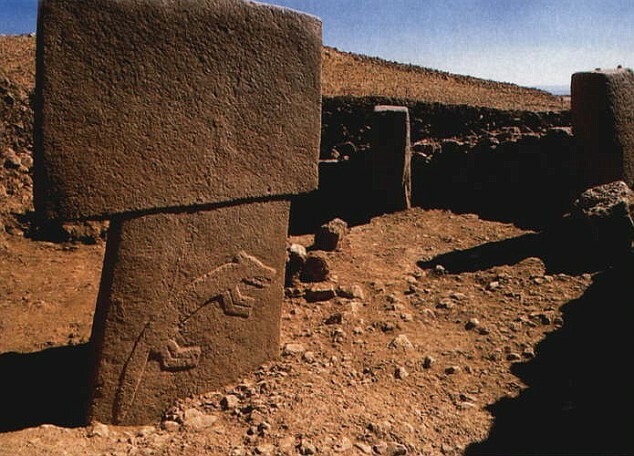 "Gobekli changes everything. It's elaborate, it's complex and it is pre-agricultural. 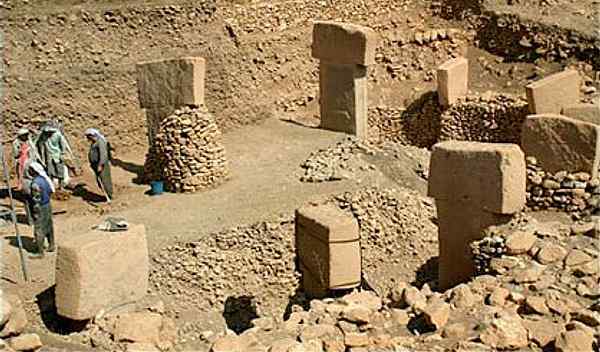 That fact alone makes the site one of the most important archaeological finds in a very long time." 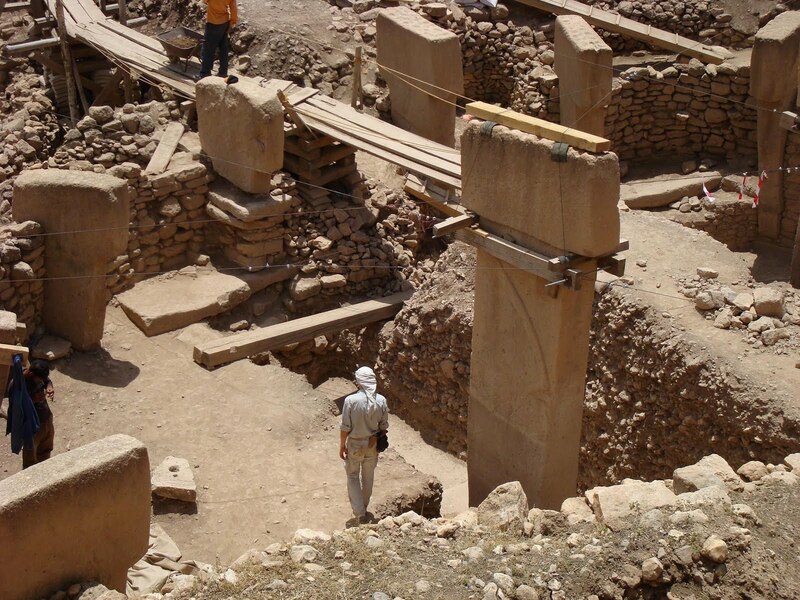 With only a fraction of the site opened up after a decade of excavations, Gobekli Tepe's significance to the people who built it remains unclear. Some think the site was the center of a fertility rite, with the two tall stones at the center of each circle representing a man and woman. It's a theory the tourist board in the nearby city of Urfa has taken up with alacrity. Visit the Garden of Eden, its brochures trumpet, see Adam and Eve. Schmidt is skeptical about the fertility theory. He agrees Gobekli Tepe may well be "the last flowering of a semi-nomadic world that farming was just about to destroy," and points out that if it is in near perfect condition today, it is because those who built it buried it soon after under tons of soil, as though its wild animal-rich world had lost all meaning. 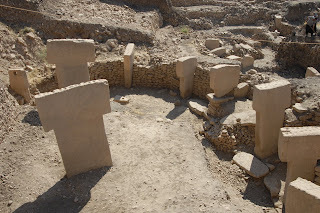 But the site is devoid of the fertility symbols that have been found at other Neolithic sites, and the T-shaped columns, while clearly semi-human, are sexless. "I think here we are face to face with the earliest representation of gods", says Schmidt, patting one of the biggest stones. "They have no eyes, no mouths, no faces. But they have arms and they have hands. They are makers." "In my opinion, the people who carved them were asking themselves the biggest questions of all," Schmidt continued. "What is this universe? Why are we here?" With no evidence of houses or graves near the stones, Schmidt believes the hill top was a site of pilgrimage for communities within a radius of roughly a hundred miles. He notes how the tallest stones all face southeast, as if scanning plains that are scattered with archeological sites in many ways no less remarkable than Gobekli Tepe. 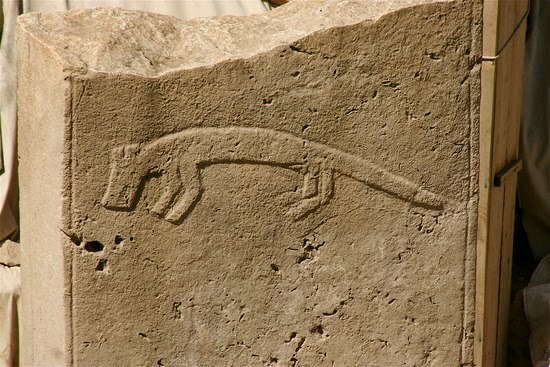 Last year, for instance, French archaeologists working at Djade al-Mughara in northern Syria uncovered the oldest mural ever found. "Two square meters of geometric shapes, in red, black and white - a bit like a Paul Klee painting," explains Eric Coqueugniot, the University of Lyon archaeologist who is leading the excavation. Coqueugniot describes Schmidt's hypothesis that Gobekli Tepe was meeting point for feasts, rituals and sharing ideas as "tempting," given the site's spectacular position. But he emphasizes that surveys of the region are still in their infancy. "Tomorrow, somebody might find somewhere even more dramatic." 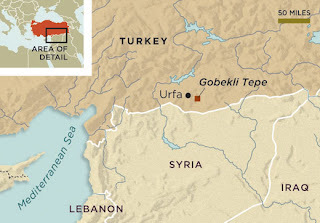 Director of a dig at Korpiktepe, on the Tigris River about 120 miles east of Urfa, Vecihi Ozkaya doubts the thousands of stone pots he has found since 2001 in hundreds of 11,500 year-old graves quite qualify as that. But his excitement fills his austere office at Dicle University in Diyarbakir. "Look at this", he says, pointing at a photo of an exquisitely carved sculpture showing an animal, half-human, half-lion. "It's a sphinx, thousands of years before Egypt. 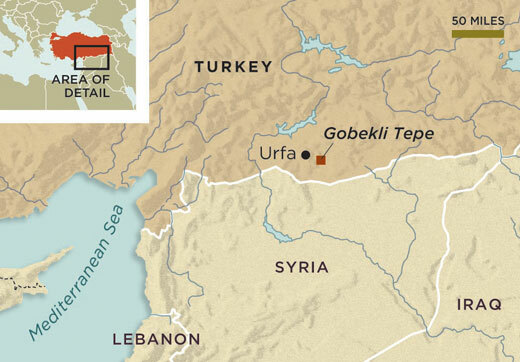 Southeastern Turkey, northern Syria - this region saw the wedding night of our civilization." Look at the current New Yorker...Dec.19&26, 2011. It is what led me here. Thanks. MJRoss: You were right to come here, or almost anywhere but with the New Yorker article, one of the worst I've ever seen on GT, where the so-called "writer," after visiting the site for 3 or 4 days, wrote about almost everything else, including the Bible, except what he actually saw. they seem to be leading far more peacefull life than areas current habitants. Living with nature , animals so on. May be they were more clever 12.000 years ago than today !!!.. The collective unconscious has manifested itself in the material world thru what we call the "world wide web". Massive collections of profound & compelling imagery are now readily available to us the human race, all at arms length. I have assembled a huge assortment of random images collected thru incidental search engine excavations, which cannot be placed into any specific image folder such as landscapes, architecture, people, textures, etc. Therefore, these orphans of momentary conceptual classification must be placed into a folder labeled 'misc'. This blog has been created in recognition of this phenomena & simultaneously also of the marvel of complex information systems dedicated to data manipulation & storage. These propelling us ever exponentially further thru our evolution to a final destination & Eschaton. Wherever and whomever that final illusion might be. Join me Tim Razo, in my quest for inspiration and visual stimuli in our vast ocean of thought. A social commentary (or visual playlist; and synchromysticly connected image diary if you will), with only idealistic positivity as a goal, is what we shall find.